The crib bumper and window seat cushion finally arrived this week, and my father-in-law finished the window seat bench top! 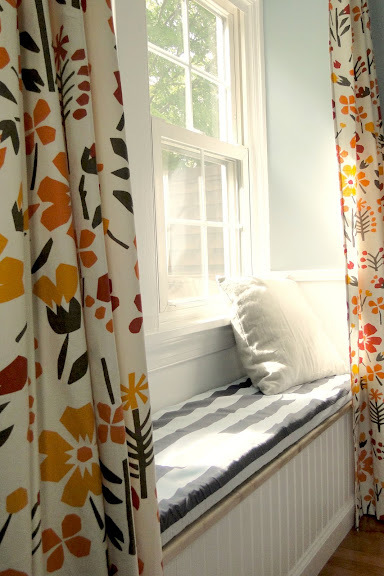 There are a few little details that still need to be taken care of, like painting the top of the window seat white, getting a new wall sconce and making a couple more pillows, etc. but the important things are finished and I couldn't wait to post pictures. 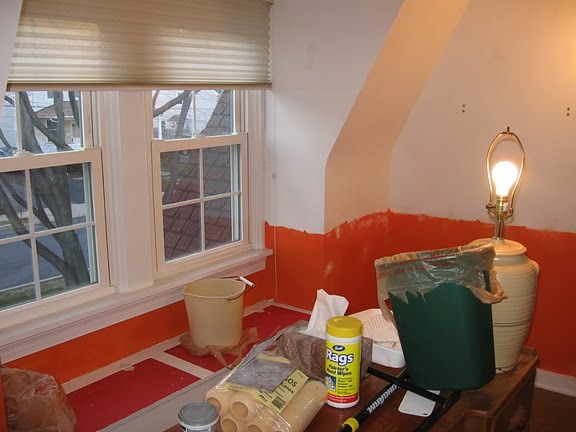 Oh and picture a sports border in between the orange and 'dinge' colored paint. In our zest to remove it, we forgot to take a true before photo. We went with a custom bumper from etsy seller Jayna at RockyTop Designs. She did a fantastic job! Her prices have gone up a bit since we ordered because she is so busy she had to hire extra help. Plus you now receive your bedding more quickly (7 weeks vs. the 13 that we waited). I think that's a great deal. The rest of the bedding is just plain white. In such a small space we didn't want anything too busy. Our owl was a gift from a coworker and his wife. 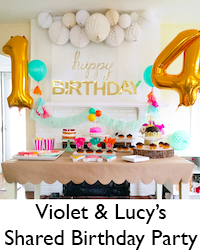 They follow the blog and picked out a perfect gift for little Violet's nursery! 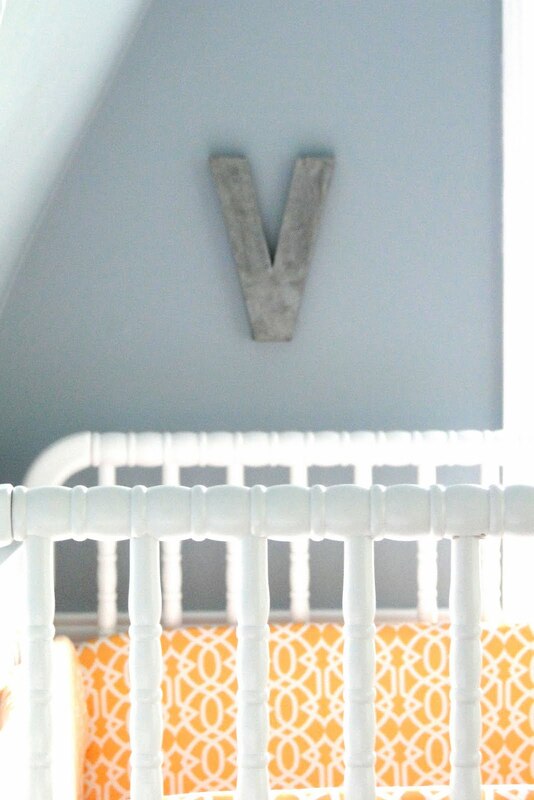 The 'V' wall letter is from Anthropologie. We got our crib on Cyber Monday for $103 from Babies R Us! It's sturdy and was pretty easy to put together. We love the Jenny Lind style - so classic. We scored the glider at a neighbor's yard sale a while back. It was only $5! She keeps her stuff in great condition, but was downsizing to a smaller place, so the glider had to go. We got really lucky - it's practically brand new and is so comfortable. The beautiful crocheted baby blanket was a gift - handmade is the best! I am sooo in love with our new window seat bench and cushion. It opens up for storage and is a comfy cozy place to sit and survey the neighborhood or read a book. I made the pillows myself (and I'm pretty proud of it too - I'm NOT a sewer by any stretch of the imagination) I think I'll make a few more, but sewing is tough when you're 39.5 weeks pregnant. 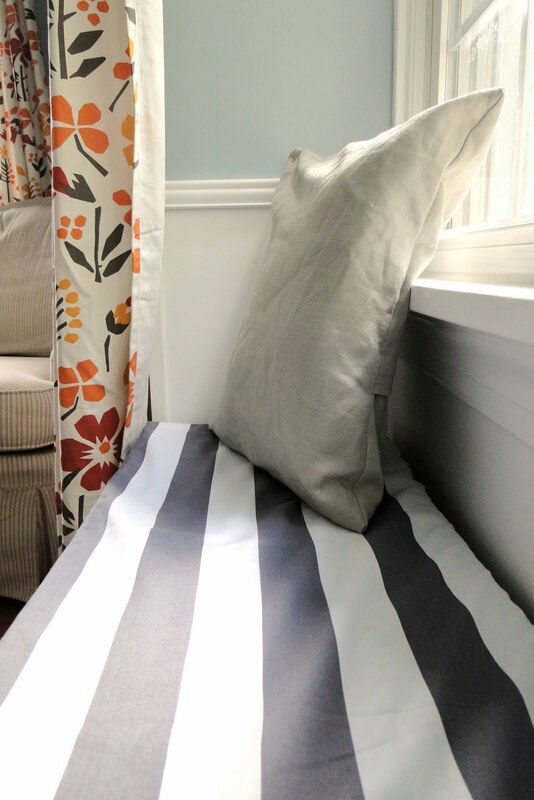 The window seat cushion is also a custom piece from Jayna @ RockyTop Designs on etsy. The baby gym is LEKA from IKEA. The simple clean lines are great, it's not plastic, and the toys can be changed out easily. The rug is super soft and fluffy and adds some great texture to the room. I think Violet's going to love sitting on it to play. We got the last one for $80 on Overstock. I've been wanting this 'Love' print from Jennifer over at madebygirl FOR EVER. I'm so happy it's finally in Violet's room! The cute little crocheted monster is from etsy seller kdericks - what would I do without etsy? (Probably spend a lot less money haha!) The shelving unit was a hand-me-down from my sister-in-law, but I'm guessing it was from IKEA. I love the crocheted flower garland that my Grandma (Violet's Great-Grammy) made for our shower. It makes a perfect nursery decoration! 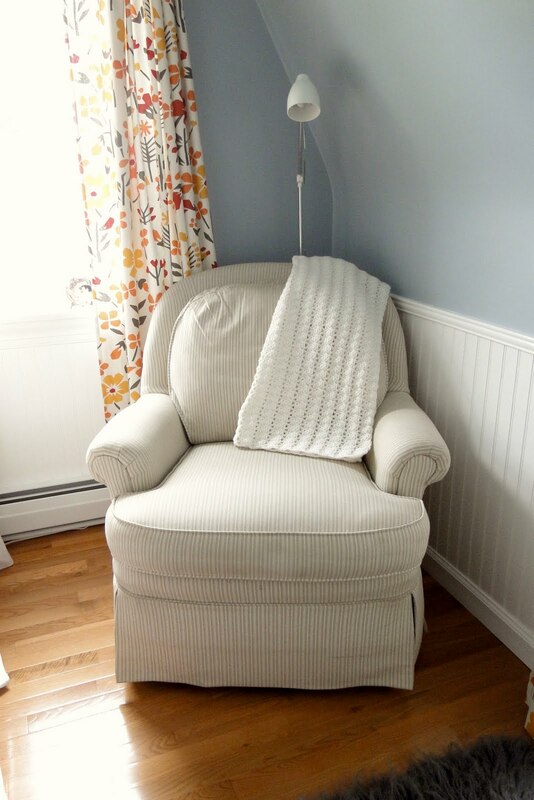 The organic Boppy cover is from Babies R Us. We also got the waterproof slipcover to go underneath it. I can't wait to try it out! Please excuse the wall sconce - we still haven't found the perfect thing, and this one is functional for now. I painted the tree and the hand-me-down dresser for the nursery and added fabric leaves to the wall for a little added texture. We also replaced the wooden knobs on the dresser with white and metal ones (we couldn't decide between white or metal, so we did both). It's amazing what you can do with a little paint! Mr. Fox and Mr. Owl were gifts from my sister. They really helped to jump start the whole nursery design. Owl & Fox: Etsy Gifts from my Sister = free! 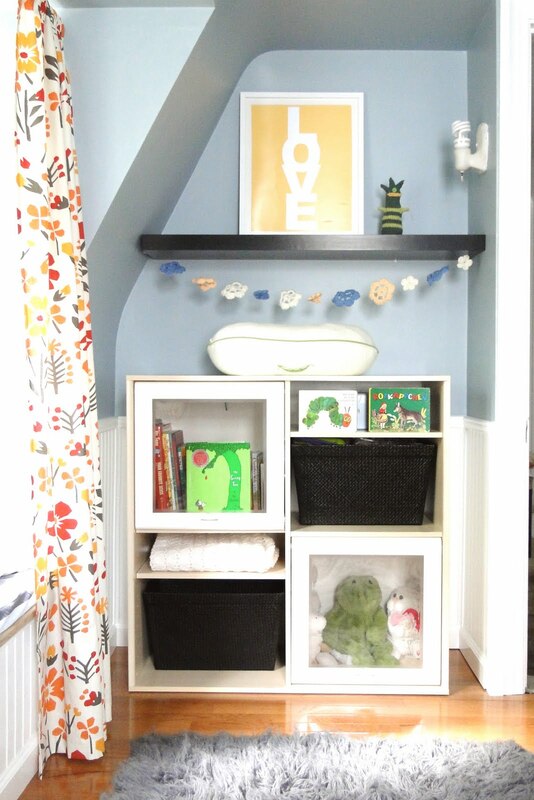 Grand total for nursery construction, furniture AND decor: $885.47! To see all of our nursery posts, click here. Thanks for letting me share and have a great weekend! I did a post on the sources that are not listed here. I had to add, the YHL people spent over $700 on their nursery and they didn't add new flooring or have to buy their crib. You guys ROCKED the budget on this one. You did a really great job with this room. I really like how its not so overly cute or novelty like. It's a very special place for little bebe with room to grow. It is stunning! I love every bit of it! Congrats on getting it done! Beautiful! I love the colors you chose. The curtains are just gorgeous against those walls. 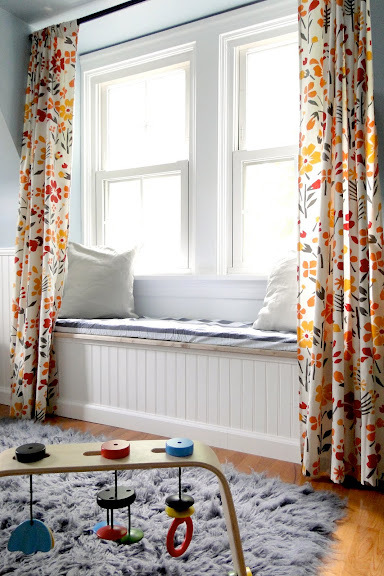 And I'm super jealous of the window - the whole space is just perfect! I love everything about it! I never made a custom space for any of my kids- I'm not creative enough and hate out-of-the-box design. Yours is absolutely beautiful and something she can grow up with. The pillows are beautiful! The crocheted flower garland...ADORABLE! I made a dangling version in my head the instant I saw it for my daughter's room. This is just so adorable! Perfect space for a baby girl. I love the colors and finishes! The crib is just darling. Lauren - it's gorgeous! I love the soft soothing colors. 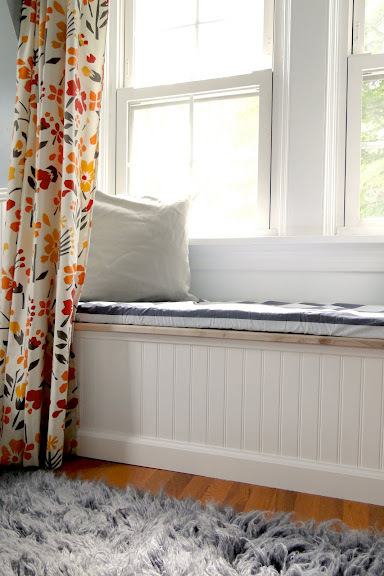 The window seat is awesome and the accents are all so pretty! Great job! Perfect place for Violet! Love it! It is soo adorable! It's a beautiful space with a perfect mix of color and not-over-the-top girly details. It's fabulous. I especially love that bumper fabric. Soo cute! Really, really lovely! Violet is a lucky little girl! I love it! The fabrics and colors you went with are perfect!! Slide in a queen sized bed and I'd be set ;). You have done an amazing job. Simply beautiful! Love it! I would have never thought of using that wall color in a nursery, but with the other colors and patterns it all looks so cheerful and happy! Great job! 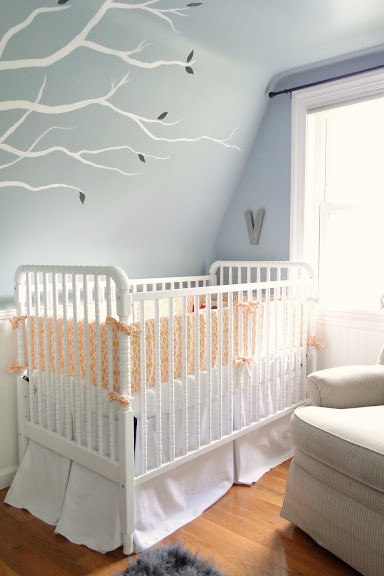 This nursery is absolutely perfect - it looks like it's right out of the pages of a catalog! Great photos, too. 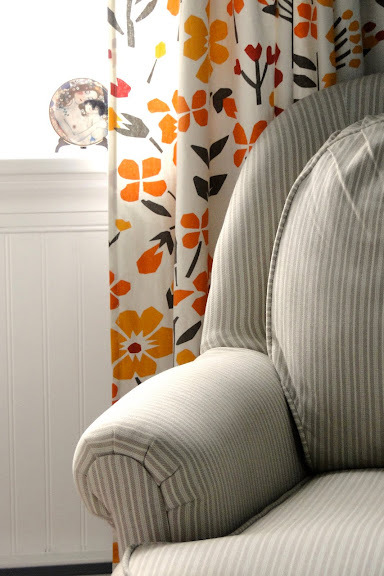 I love the color scheme - I'm kind of going for that same look in our guest bedroom right now, actually! Those curtains are great. All of your accents and colors are just so fresh and lovely. Ok, I'm going to stop raving now - job well done!! LOVE this! Those curtains are to die for. We're using Jenny Lind cribs also - so classic and timeless. And we have the same metal owl (from Target). This room is just gorgeous! so very cute! We are doing a girls nursery on a budget, but you have blown mine out of the water! Great job!! What a fantastic job. I am a new follower and can not wait to get caught up on your blog. PS-you and my daughter share the same name! 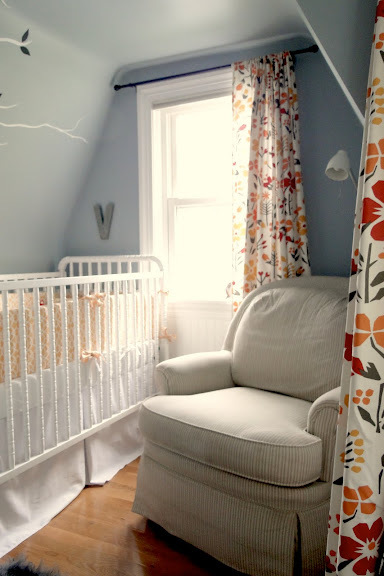 the nursery is absolutely adorable. 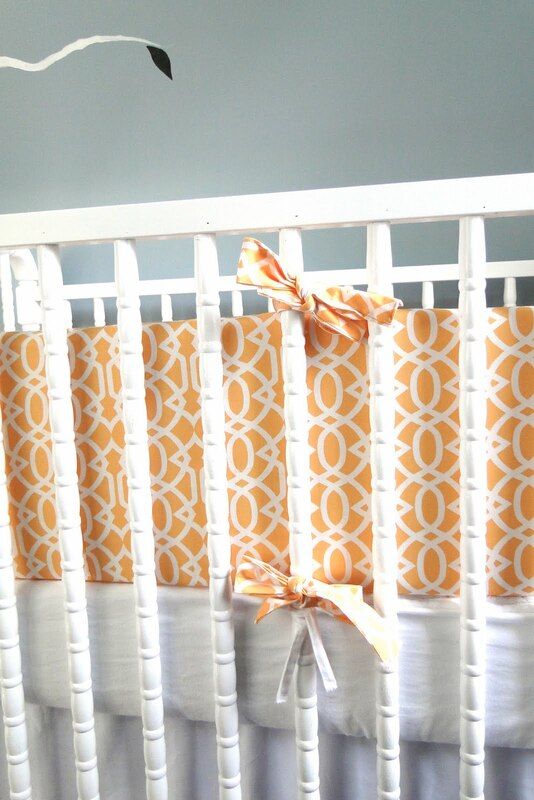 question for you, i know you listed the crib skirt as a gift but do you know where it is from? i have been searching for a plain white crib skirt just like that and have had no luck! thanks! It's beautiful! 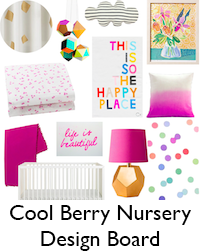 I've never been excited about nurseries before (as I don't have any of my own babies yet!) 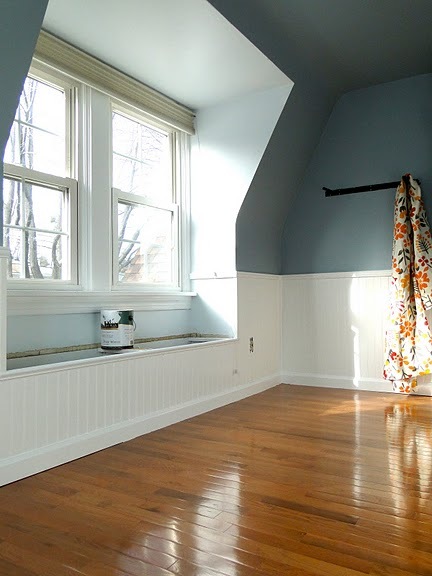 but I have fallen in love with this room, and bookmarked it :D The colour scheme is soothing and so unusual. It's a very chic room. I'm sure your little girl will develop a great sense of style and taste! Your daughter is gonna grow up and be one smart cookie....how could she not when she's gonna be mentally stimulated by PERFECT surroundings??? I'm linking over from DIY and I agree with what she said: not one single thing I don't love. Your nursery is so fresh and pretty! Love it! Great job! WOW!! I love this room!!! It's so earthy and peaceful! I love the colours, and the layout. What a lucky little girl. Best of luck with delivery!! I too LOVE the bumper fabric. I went to the Etsy shop and didn't see it- do you know if it is still available/what it's named? That HAS to be the most fantastic nursery I've ever seen!! No joke. LOVE it! The subtle blue with the orange is so unexpected and fresh. Fantastic job!! I LOVE IT! I popped over from DIY Show Off and just had to tell you what a GREAT job I think you did! Thanks so much again all! French Press - I know Jayna changes out her fabric choices quite a bit. If you contact her, just ask if she can still do the imperial trellis fabric. You guys did an amazing Job and the budget... WOW!!! 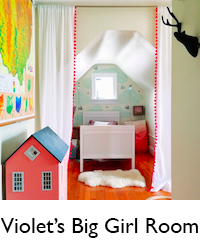 I cannot wait to see pictures of Violet in her beautiful room, Im sure she will enjoy it for many years. this is so fantastic, i love the colors you chose! coming over from diy show off, btw. Oh, I am in love! LOVE the color palette and attention to detail. Such a peaceful, sweet nursery. Thank you for sharing it. Absolutely GORGEOUS!! 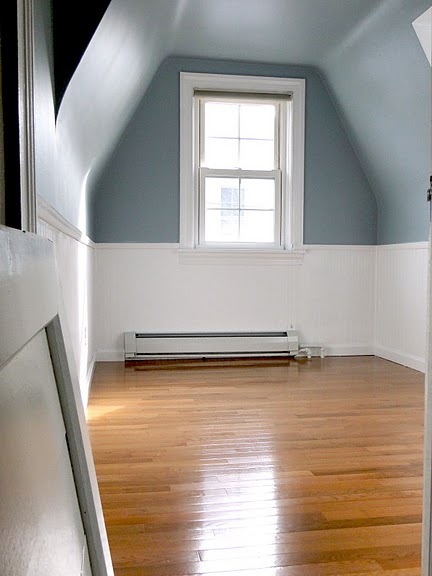 Sorry if I missed it in the post (I might have... don't be too annoyed), but what is the wall color? Thanks Shannon! 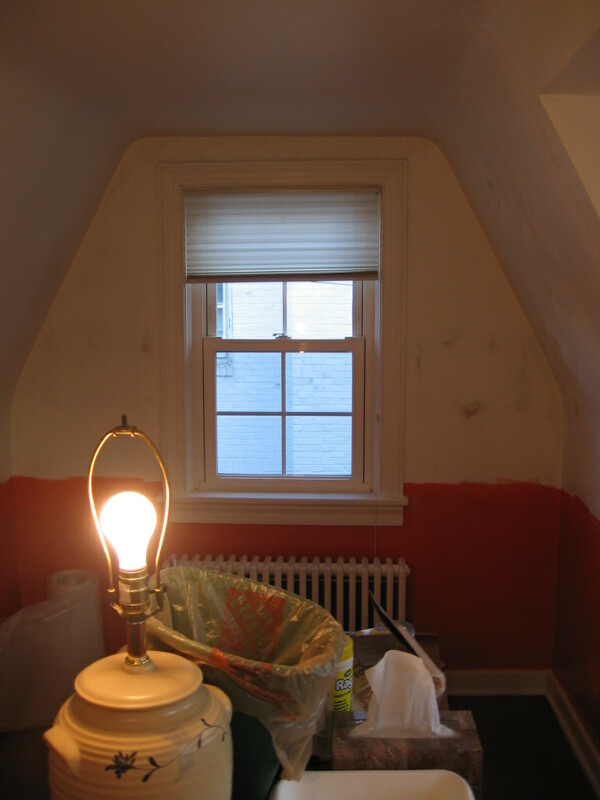 No problem - it was a long post :) The paint color is Behr Prelude. Wow, kudos to you! 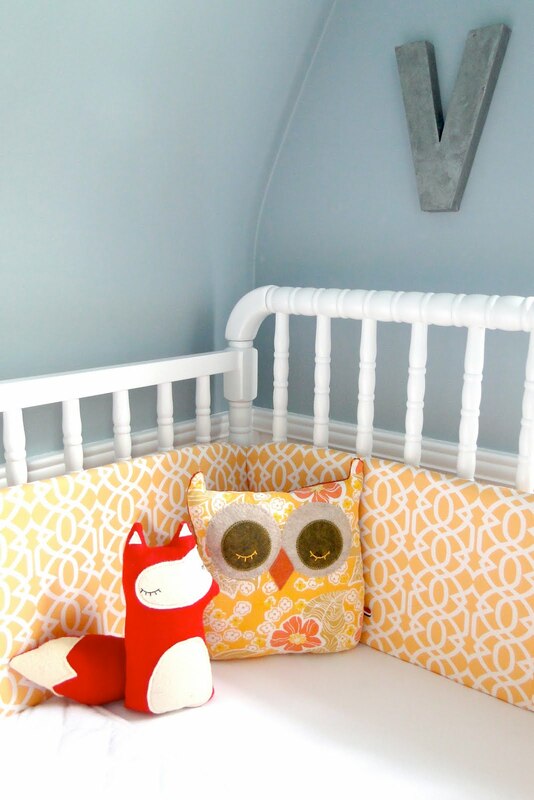 This nursery is just outstanding and so sweet for a little girl. 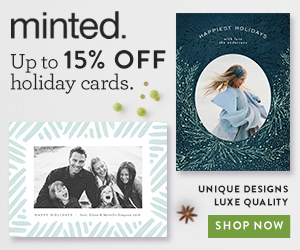 Congrats on the Design Sponge mention, as well! Congratulations! My little miss Violet just turned one this past weekend! She has the same anthropologie letter V :) Great room, she'll love it and importantly you will too. Cute cute cute! I came over from 6th street. I love seeing nurseries that aren't the typical pink. I too scored the Jenny Lind crib at babiesrus for $103!! Don't you just love their 20% off coupons!? 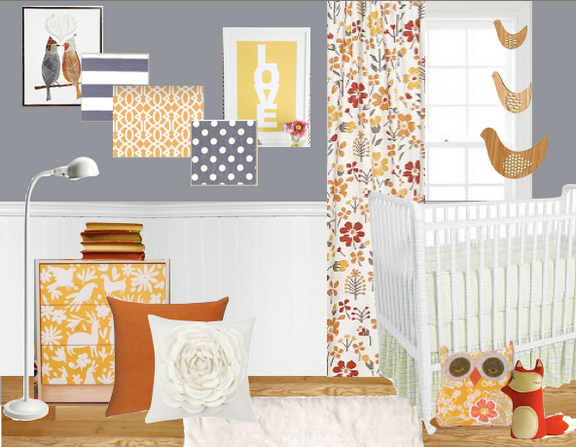 I have the same yellow LOVE print in my baby girls room--- it's one of my fave things in there. I commented over on D*S but I wanted to say I think this is the most beautifully done nursery I've seen, especially on the budget you used! I think the colors are simply stunning. 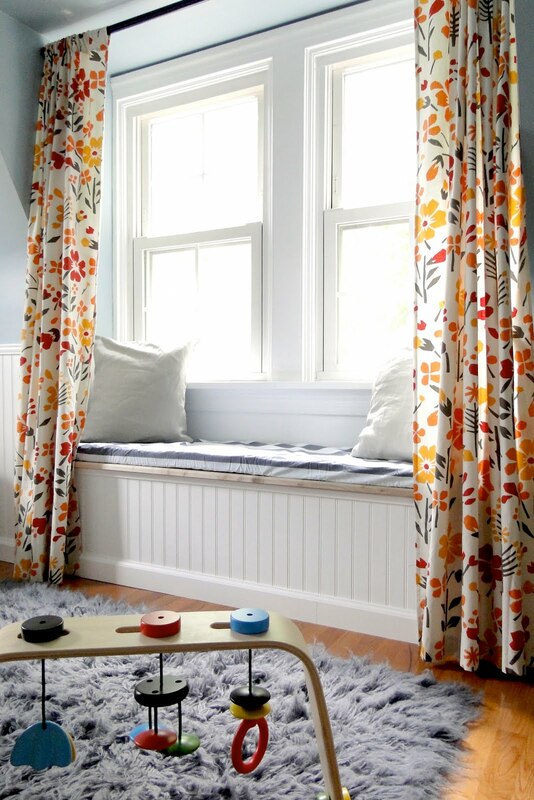 i saw those girard curtains and wanted to purchase them for our nursery too! they are beautiful! too bad i waffled for too long that they sold out! 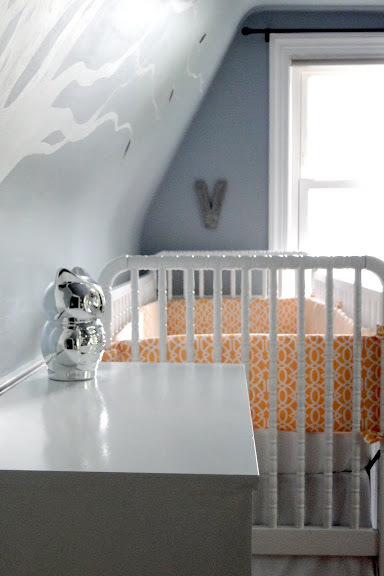 gorgeous nursery, great job! and such a good deal on the glider! oh for REAL?! it is BEAUTIFUL! :) *I* want to live in that space!!! First, I LOVE your nursery; I've shown all my friends who have been within a quick jog of a computer since I saw it on design*sponge. Second, That IKEA gym has gotten the most bang for its buck at our house of any of our baby buys (and we've had a LOT of trial and error baby buys!). From very early on, it was a mobile-like toy, then a swatting and grasping toy, then a motivation to get up from laying on the belly (to crawling position), then it was fun to manipulate seated, soon it was a pull-up bar that was TOTALLY stable because of the long "feet", it quickly became a push toy to start walking, somewhere in there our son found great delight in removing the toys, and now at 17 months he still pushes it around often, and he has figured out how to put the toys back on the gym (he has used it almost daily since we bought it around 2 months!). 15 MONTHS OF USE FOR ONLY $25?!?!?! AMAZING! No other toy I've ever found has had that kind of longevity and widely varied functionality!! Excellent buy... and it doesn't have a single ugly logo or princess on it! I LOVE it...absolutely adore it! Absolutely gorgeous nursery. Just love, love, love it. Hope you get to meet your baby girl soon! This is a really beautiful room. Careful of the rug though - once baby is rolling she'll have a mouth full of fluff, which could prove dangerous. Great job guts! Congratulations on your baby girl! Just found you through making it lovely. I have a 7 month old girl whose middle name is Violet (first name Georgia) and I have the same yellow LOVE print from made by girl. Small world of good taste :) Love the nursery. It will bring all of you hours of pleasure. 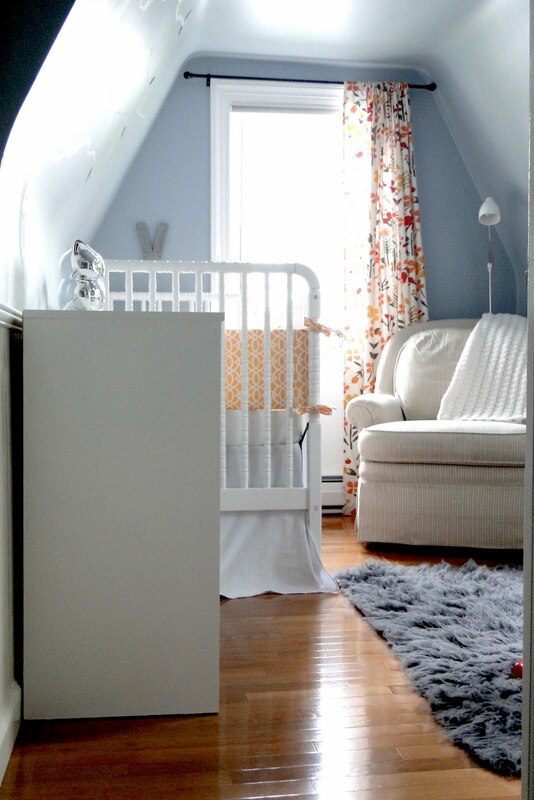 this is such an adorable nursery. you guys did such a lovely job on a shoestring budget. kudos to you. do you know where the owl and fox is from? If you guys ever decide you don't want those curtains... email me! LOL. I'm so sad they're gone at UO! 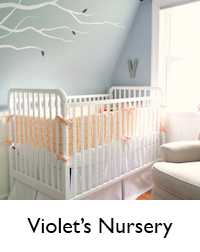 I've been seeing your nursery popping up on a few blogs, and rightly so - it is gorgeous! What a fantastic job you have done, the colours are stunning, and I'm so impressed with your budget! Really nice job! so, so beautiful! the only question i have is where you found that beautiful bird mobile (that i saw on your idea board but not in the room). i'm in love with it. absolutely in love. Popped over from Mabel's House. This room is so beautiful! And congrats on the baby girl. I just have to tell you...I keep coming back, over and over, to your pictures. I love you ideas, and they are being my inspiration for our room! Here I am again, getting ideas! 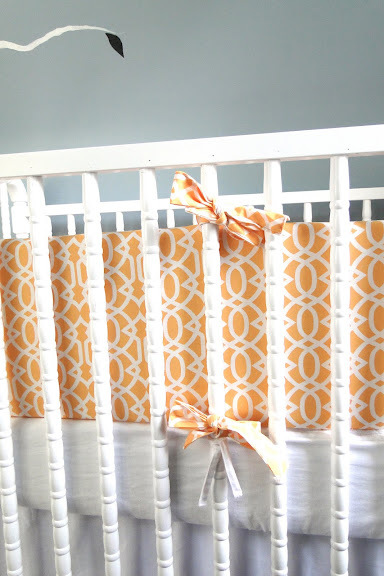 Could you share where you got the sheets and crib skirt from (other than "gift" -- but, how lovely is that?)! 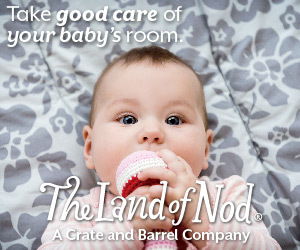 love your crib! I'm looking for one just like it right now. i tried to find it on babies r us's website and couldn't ;( if you can find the link for me, i'd really appreciate it. Could you give any tips for how you painted the dresser? I am considering doing something similar and am wondering if there is a special white paint I need to use that will resist scratching. Also, do you know of any curtains similar to the Girard ones since they are out of stock now? Nicole - we just lightly sanded, primed, and painted it white. 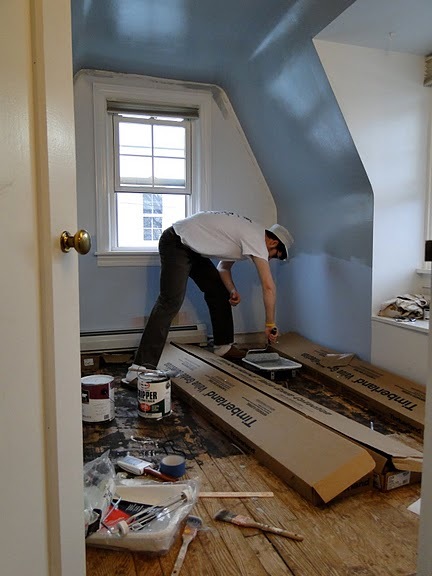 You could skip the priming step if you use primer + paint in one. To get it to resist scratching, use a coat of polycrylic to finish it off. Hope that helps! 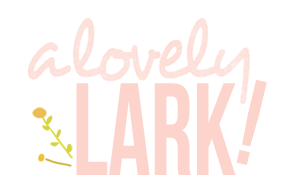 i have had your beautiful nursery bookmarked for-ever (love your blog). My question, I am trying to do a wallpapered piece (stool) with the paper in your inspiration board dresser (it's wallpaper, right?!?). I have seen this dresser elsewhere, but all of a sudden it is alluding me...could you provide your source pretty please? What an amazing job in your nursery! I absolutely love it. Can you tell me the name if the paint colour you used? Beautiful nursery, by the way! Love the cheery colors.